Why The Heck Am I Sitting On $250K !? I have $250K right now doing absolutely nothing. That's right nothing*. And I'm perfectly OK with it. Why the heck would I be doing that? I'm waiting for a sale. a) A bucket of money you need to invest. b) A hyperactive market that makes it too costly to buy in. These realities came to be for me in late 2013 & to date in 2014. The upside will be well worth it when the next market correction takes place. So I wait and I'm fine with it. 1. This is not our entire portfolio. Just a portion of it. The sum of $250K is well under 50% of our household's net worth (no, I won't get into more specifics) but it's still a significant chunk of money for us. 2. The market is too expensive right now. Screen shot of the DJIA via my iPhone late last week. It doesn't take a rocket scientist to agree with the fact that the market has been insanely bullish over the last few years (aka stocks are really expensive) and the opportunity for stock appreciation is slimmer, given the inflated price leaves little room in the medium term for more growth. If someone were to ask me whether it makes sense to buy into the market with this sum right now, I would not recommend it because the market growth has pretty much applied across the board and there aren't many deals to be had. The way I see it, if that's what I would feel good telling someone else, I see no issue applying it to myself. No. I don't have a crystal ball. I'm not saying I know when the next correction will happen. I'm simply working with probabilities. Continued market growth over the medium term is not sustainable. There will be a correction at some point and, when it happens, I'll be ready for it. 3. Yields are much greater when stocks are on sale. I intend to buy market-indexed ETFs with associated DRIP and reputable dividend-paying stocks (aka "dividend aristocrats"). With a focus on dividends payments, my yield will be much higher if I purchase financial assets when they are offered at a discount. Which one would you prefer? I've done the math and, even by foregoing compounding dividend payments I would make if were I to invest now, we can wait a good while before this strategy proves out to be a costly mistake. 4. I will be buying to HOLD, HOLD, HOLD. As I do with the rest of my holdings, I'm going into it for the long term. What I'm potentially forgoing right now will pay off in the long run by being patient. I'll be paying a single online discount brokerage fee** for each wave of the purchasing (currently planned in 3 waves) and will hold on to these financial assets for decades. 5. We have no alternate use for the money. Putting some of the sum to pay off debt at a higher interest than market returns would make sense, but we don't have any. We have no debts to repay and don't need to make any significant purchases. There is no alternate use for any of this money. Putting some of the sum to pay off debt at a higher interest than market returns would certainly make sense for many households. 6. If buying on sale is one of Buffett's tactics, that's good enough for me. Buffett is worth how much now? I consider this man's advice to be sound. The next time you see investors running for the hills, I'll be smiling and will be happy to scoop up what others are in a hurry to dump. For now, I sit and wait. And yes, I'm sleeping well at night. *Yes. It's making a bit of interest but obviously not what it will make in returns once invested. To me, barely keeping up with inflation equals nothing. **I fired our financial advisor some time ago when I realized he was more interested in his return than ours. Any financial advisor that is not fee-for-service based has an automatic conflict of interest. I'm quite happy paying 0.5% or less per year on the MER of ETFs I purchase on my own, especially given their performance will outpace the returns of any actively managed mutual fund. More than that really eats into our returns. Don't believe that statement? 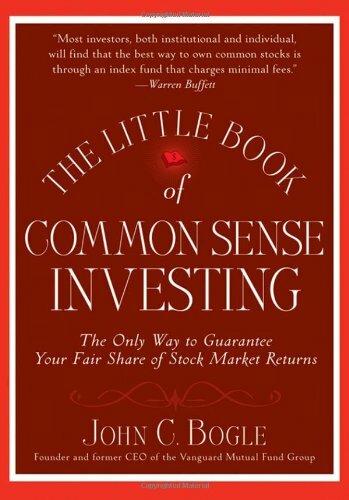 Read John Bogle's book. You'll be convinced by the numbers and the overwhelming third party validation from active mutual fund managers themselves. This post contains affiliate links to amazon.com. Purchases made via these links help support the F2P blog. It does not cost you anything and helps cover ongoing expenses associated with maintaining this blog. Thank you for your support.